World-class martial arts training from the source. World class training from the source. Bring a friend and you get 10%! Get coached by skillful masters and grow your potential! What is Chinese traditional Shaolin Kung Fu? Chinese Traditional Shaolin Kung Fu has no written Scriptures, but follows nature, with a history going back 5000 years, composed of the specific forms and unique training methods. Shaolin Kung Fu is a very important part of Chinese Traditional Culture. It is based on Yin and Yang, Five Elements Theory (Lungs pertain to Metal, Kidneys pertain to Water, the Liver pertains to Wood, the Heart pertains to Fire, and the Spleen pertains to Earth), and the Book of Change (I Ching). Shaolin Kung Fu also absorbs the essences from Confucianism, Taoism and Buddhism, getting meridians and collaterals and meridian points theory from Chinese Traditional Medicine. What can you get from Chinese traditional Shaolin Kung Fu training in Tianmeng Academy? ——- Chinese Traditional Kung Fu is a Magical Box. From this box, you can get what you want, including a healthy body, good sleep, longevity, graceful body shape (not fat or thin), optimistic mood, broad mind, strength, speed, flexibility, coordination, responsiveness, integrity, magical fighting and combat abilities, strong self-defense, a strong will, extraordinary courage, the ability to adapt to different environments, independence, and the ability to cooperate with others. Inspiring thinking, wisdom, strong learning ability, and high working efficiency learned in Traditional Kung Fu Training can make you succeed in your career more easily. You will have more time to enjoy your life, with great relationships with family and other people, and you will achieve a great sense of happiness in helping others. If learning traditional Chinese Shaolin Kung Fu in China is your dream but you do not know how to accomplish it, look no further. Now it is possible for EVERYONE! 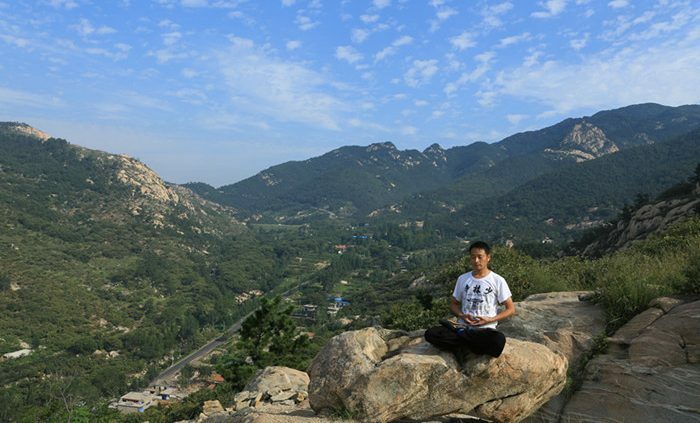 Tianmeng Kung Fu Academy is nestled between the footsteps of Tianmeng National Park and Water Park, located in the peaceful and friendly environment of ‎Fei Xian, Shandong province, China. Tianmeng Academy is unique in its authentic methods of teaching Shaolin Kung Fu in China. The students have an opportunity to train in the ancient Chinese Shaolin Kung Fu style “Meihua Quan”(plum blossom). It had been secretly handed down from master to disciple for thousands of years in China. Additionally, “Meihua Quan” includes training on and between special “Meihua” poles. Tianmeng Kung Fu Academy provides highly qualified Chinese Masters in traditional Shaolin Kung Fu styles, such as: Shaolin Kung Fu, Sanda (Chinese Kickboxing), Wing Chun, Tai Ji, Qigong, Bagua Zhang, Xingyi Quan, Ba Ji, Qinna, Mantis, Meditation and others. As an addition, we offer classes such as Chinese Culture, Martial Arts theory, Mandarin, Chinese Traditional Medicine, Calligraphy and others. Our masters are authentic Shaolin masters from the Shaolin Temple. They have rich experiences in teaching international students. They are dedicated to teaching their students and “opening” their individual potential. The mission of the Academy is to harmonize the Three Treasures – Essence, Energy (Chi) and Spirit in each student’s life. Tianmeng Academy believes that the journey to Kung Fu Mastery will empower each student’s wellness, life style, healthcare and longevity. So do not DREAM your life, LIVE IT! See you soon in Tianmeng Shaolin Kung Fu Academy! Sign up for our newsletter and stay up to date with Tianmeng Academy!